When you need a doctor Good Shepherd Medical Group (GSMG) is your source for high-quality health care close to home. We offer primary and specialty care services conveniently located in Hermiston. Each of our health care providers are board certified or board eligible in their respective fields – many fellowship trained, giving you the confidence and peace-of-mind that your doctor is an expert in their field. Our providers are able to care for your family through every stage in their life, from newborn, adolescence, adult, and elderly adults. We also care for individuals with acute and chronic conditions with a personalized treatment plan that will fit with each lifestyle – making you an owner of your own health care. If you are in need of a specialist our providers will help coordinate your care with the best in the region. 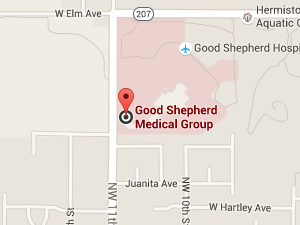 All of our providers are conveniently located on the Good Shepherd Health Care System Campus. If you need insurance we can help! Click here for information about Oregon Healthcare.